Karanpuri " Heavy Duty" Rigid type tiller is designed to with stand toughest work conditions of hard black soil. The profile cut tynes get their strength because of a peculiar design in which the stress prone points are shaped to resist any restoring strains. Main frame is made out of heavy angles duly reinforces with projection flats. Description : The Heavy Duty Tiller is designed to work in varied conditions for the toughest of operations. 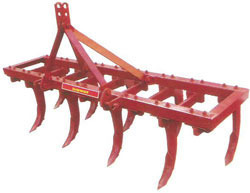 Its strong frame and heavy duty angles provide strength to the spring loaded tine assemblies to work in toughest of conditions for loosening/aerating soil up to 9 inches deep. Make – Kirloskar Oil Engine Limited. - UNIVERSAL Heavy Duty Rigid tillers have a sturdy construction design and are capable of withstanding tough working conditions of hard soils. - These can break up hard soil efficiently and perfectly. - They uproot stubbles and weeds to leave the ground perfectly worked. The manufacturing of the tillers is done under the supervision of our professionals who had done a commendable job. Our team has manufactured the Heavy Duty Rigid Tillers in a way that it can be installed easily by everyone. The product is appreciated by our clients for its raw material and supreme quality. Our rangeof Extra Heavy Duty Adjustable Rigid Tiller is known as a multipurpose heavyduty tiller. By minor adjustment the tiller can be converted in to ridger orgrass clearing implement. These can be availed at industry leading prices byour clients. WE PREFER BUSINESS FROM GUJARAT ONLY. - This Tiller is designed to work in toughest working conditions of hard black soil using profile cut single piece Tynes of 28, 25, 22. - Main frame is also of heavy angles duly re-inforced with projected flats, it has got life long durability. 'heavy duty' rigid tiller is designed to withstand toughest work conditions of hard black soils. Main frame is made out of heavy angles duly reinforced with projection flats.